2017 Cash-Out Refinance Options: Is Now The Time For A Refinance? With the new year and the ever positive housing statistics that have been coming out as of late, now might be a great time for you to tap into your home’s equity and pull some cash out for investments, additional properties, home repairs, upgrades, college tuition, or even a well deserved vacation. Now might be one of the better times in our recent history to get access to the equity that was hard to find during the Great Recession. As mentioned in previous articles, 2016 ended the year with the smalles amount of homes for sale in recent memory as there was only a little over 3 months of inventory on the market. Now that we are into 2017 some preliminary reports are getting released and we are seeing new homes being started at higher levels than all of 2017. The other statistics we are seeing is the continued reduction of the foreclosure quantity which ultimately drives home prices up since houses aren’t selling well below market value. Home foreclosures is one stat that destroyed home values during the Great Recession as numerous properties were sold under market value thus hindering the prices of homes trying to sell normally. Now that we are in a seller’s market with a low level of inventory and foreclosures we are seeing prices begin to jump and the national average of home values is finally up past the peak levels of the original housing bubble. Now there shouldn’t be a need to worry as the increase in housing prices is being seen in Middle America and not as much from the already pricey cities. Given this, you may be wondering what your 2017 Cash-Out Refinance Options are, and we will go into them now and you can decide which option is best for you and we can help you get that money you want! 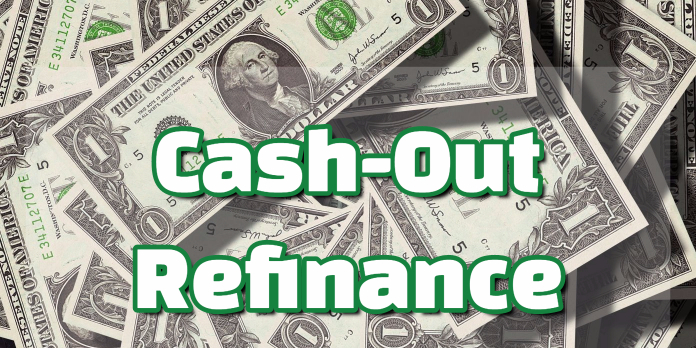 Before we go into the 2017 Cash-Out Refinance Options, you first need to know what a cash-out refinance is. To break it down in a simple manner, if you owe less on your home than what you home is worth, you can borrow a certain about of the equity in the form of cash and it gets rolled into your current loan with new payments terms. Since this is not a home equity loan, it does not come with its own note to pay back. For example if you have a home worth $250,000 and you only owe $200,000 on it, you are able to access up to $50,000 minus any closing costs that may arise. Like mentioned earlier, you are able to do what you want with the proceeds as most lending institutions and loan programs have no restrictions on use of funds. The first loan we are going to look at is the Conventional Cash-Out Refinance. One of the main reasons for you to go this route would be to refinance out of an existing FHA Loan where you are paying a monthly Mortgage Insurance Premium or MIP. Also, if you have at least 20% equity in your home, your Conventional Loan will not have to pay PMI or Private Mortgage Insurance which can end up saving you hundreds of dollars per month. Rates on these loans can rival those of the government loans (FHA, VA), however, you may actually obtain a higher mortgage rate if you have a high LTV because mortgage rates shift with Conventional Loans given LTV and credit score. For example, if you have a 620 FICO and a 95% LTV, your rate will be significantly than a borrower with a 700 FICO and 80% LTV. Another cash-out refinance option is an FHA Cash-Out Refinance which can be broken out into 2 different options: FHA Streamline and a standard cash-out. For those of you looking to go through with the FHA Streamline you are able to take on a 95% LTV but you could possibly be limited to the uses of the proceeds when you take on this loan. For a standard FHA Cash-Out Refinance you are limited to an 85% LTV. One of the main qualification guidelines is that you have been in your home for at least 12 months and it is your primary residence. In this time your loan must also be in good standing without any 30-day lates on record. For those of you veterans out there who currently have a VA Loan, there are cash-out refinance options for you as well. Just like the previously mentioned FHA cash-out refinance there is both a streamline and a standard cash-out option. The VA Streamline or IRRRL (Interest Rate Reduction Refinance Loan) does not allow you to take out any cash, but is a refinance option available with minimal documents. For your VA Cash-Out Refinance there aren’t any limits as to maximum loan size, however, a lot of lenders you will run into will enforce the Conventional Loan limits to the VA varieties. With a VA Cash-Out, you are able to obtain up to 100% of your homes value which makes it one of the best deals around for a cash-out refinance. As you can see, there are plenty of options are borrowers out there if they would like to access the equity built up in their homes. Granted, this may not be the best route for all borrowers especially those that are on a tight budget and any increase in payment could have a negative impact on their household. However, if you are comfortable with what your new payment will be, then by all means it is well within your right to access that available equity and do with what you please. If you are looking for an experienced professional dealing with cash-out refinance, then you are in the right place and need to reach out ASAP at 888-900-1020. We are here to work with you every day, night, weekend, and holiday in order to ensure you are taken care of properly. We value your business and look forward to working with you!